Abstract: In the course of the fourteenth and fifteenth centuries the Trojan legend was one of the most popular myths in the European courts, and in the Burgundian court in particular. The legend was depicted in numerous tapestries and illuminated manuscripts. This article examines the image of Troy in Franco-Flemish illumination of the fifteenth century. I explore and interpret the iconography of Troy as a mental and semiotic construct linked to such real cities as Jerusalem, Rome, and Constantinople. I will examine images of the real cities and the ways in which they influenced the formation of Troy’s iconography, a connection overlooked in current scholarship. The research will therefore focus on the permanent architectural and landscape elements borrowed from real cities, which were mythologized and sacralized in the European tradition. Emphasis will be placed on the city’s visual representation in the miniatures as influenced by literary materials (i.e. medieval manuscripts containing stories of Troy). My particular interest lies in how the image of Troy evolved simultaneously through a religious and political perspective. That is to say, I will pay particular attention to the cultural codes, the sacred topography and the contexts creating images of the nonexistent city. 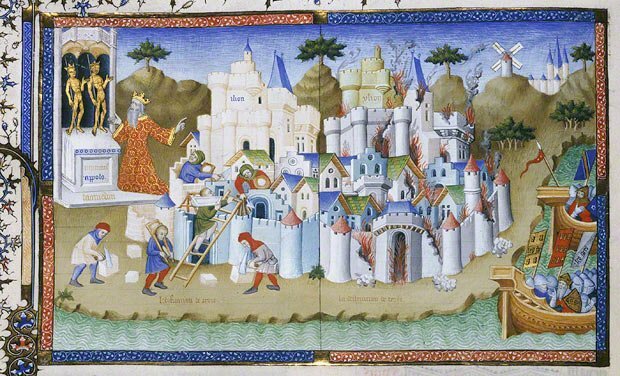 Introduction: This article examines the image of Troy in Franco-Flemish illuminations, examining how people constructed imaginary cities in the fifteenth century. By imaginary cities I mean cities that stopped existing in reality but were still depicted in art and occasionally represented on maps, as in medieval mappae mundi. The libraires who made programs of the manuscripts and the masters who created images of imaginary cities in various media including tapestry, paintings, printings and illumination, could not see these cities in reality. At the same time, these imaginary cities occupied a significant place on the mental map of the Franco-Flemish world, fueling European imagination over centuries. Miniature painters manipulated famous images of the faraway land that were influenced by the collective memory of generations and by historical events. Therefore, this paper aims to explore the iconography of Troy as a semiotic construct. My study is based on analysis of forty examples of fifteenth-century illuminated manuscripts with the Trojan legend. First, I will study both the permanent architectural and landscape elements that comprise the Troy image. Second, I will consider the influence of the literary material on visual representation, as medieval literature devoted to the Trojan cycle certainly affected the principles of its representation in the accompanying miniatures. Finally, I will compare the image of Troy with depictions of such real cities as Jerusalem, Rome and Constantinople as mythologized and sacralized by the European tradition. In other words, particular attention will be paid to the cultural codes, the sacred topography and the contexts creating the image of the non-existent city of Troy.